Our packaging is designed to have minimal impact on the environment, it is made from sustainable, plant-based materials that will break down in composting environments but what does this actually mean? Below we discuss the types of materials we use, how these are grown and how they break down after use. You will also find some useful links to other sections of the website that go into more details about composting, how to dispose of our products and more. What is your eco-friendly packaging made of? Our food and drink packaging is made from sustainable plant-based materials. These packaging materials can be divided into two camps: wood pulp and PLA products. PLA – PLA (or polylactic acid to give it its full name) is a material derived from corn starch. Our PLA products are either made from PLA and PLA only (this includes our lids, our cutlery and our clear sandwich bags) or, alternatively, we use PLA to line our otherwise paper-based coffee cups and pots to make them waterproof. Wood Pulp - Our deli papers, take out boxes and handled bags are made from paper (wood pulp) while our windowed products - such as our windowed sandwich bags, salad boxes, and sandwich packs - introduce a third material, our bio laminate film which lines the products and forms the windows. Now here’s the clever part, our bio laminate film is also made from wood pulp. It’s a cellulose-based material, cellulose is found in the walls of plant cells (in this case trees) and it is what gives the plant its rigidity and strength. 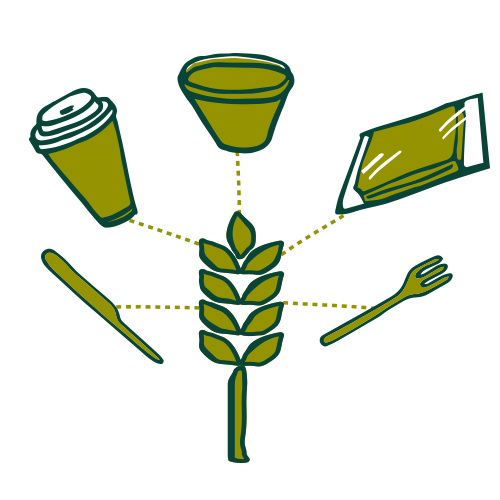 What makes your food packaging sustainable? Our products have been developed to offer a compostable, environmentally friendly alternative to polystyrene and other oil-based plastic packaging. We work with mills that source their raw materials - wood and corn starch - from renewable growth forests or plantations so once the trees and corn we use to make our compostable cups and containers have been harvested, they are replaced with new crops. A crop like corn may be harvested each year, forests however need to be more carefully managed to ensure that trees are not cut down prematurely and that there is a constant balance between young and mature trees. For example, trees used to make paper are typically between 10 and 20 years old and they are harvested during thinning whereby certain trees are cut down to make room for the growth of others. We do not use dioxins in the production of our papers and cards, dioxins are commonly used to bleach paper (you can read more about this here). We also operate an ethical sourcing policy so all of our product suppliers are commissioned for their own pro-active environmental best practice. We make regular visits to our suppliers to check for ourselves how things are being done. How do your packaging products break down? All of our packaging is compostable, it has been designed to break down in composting environments. Our PLAs are both EN13432 and ASTM D6400 certified which means that they have met the European and American standards for industrial composting. 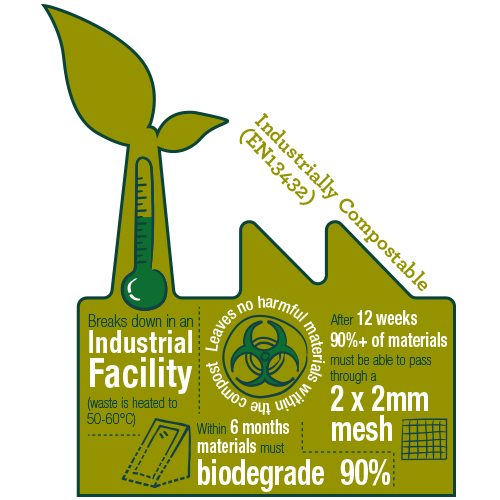 All of our products that feature PLA can be disposed of at an industrial composting facility. 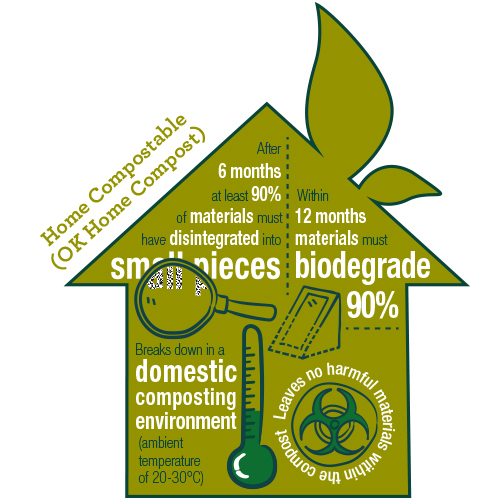 Our bio laminate film has been certified home compostable (OK Compost Home, ASTM D6400) which means that it has met both the European and American standards for home composting therefore all of our products featuring this laminate will break down in a domestic compost heap. Likewise our paper-only products (no bio laminate film, no PLA) may be disposed of in a domestic compost heap. Home compostable products are also suitable for the industrial composting process. Please note, our green packaging is not designed to break down in landfill (newspapers decompose so slowly in landfill, they may still be read after 50 years) our packaging will not compost in the ocean either. It is designed for composting and composting only. Our paper-only products – such as our handled bags and deli papers – may be recycled if they remain free of food waste. What’s the difference between home and industrial composting? Materials that have been certified as either home or industrially compostable are rigorously tested and have to meet specific criteria – some of which is shown in the infographics below - however, the main difference between the two is heat. Industrially compostable products require much higher temperatures (50-60°) to break down whereas home compostable products will break down in the temperatures naturally generated by materials rotting in a domestic compost heap (20-30°). You can read our blog post about the composting process and the difference between the terms biodegradable packaging and compostable. Why not make all of your packaging home compostable? Unfortunately home compostable films are not yet able to handle the high temperatures that very hot liquids, like coffee, can reach without starting to dissolve. This is why our cups and pots – that may be used to serve soups, stews, teas and other hot beverages – are lined with PLA, likewise our lids and cutlery which also require the added strength of PLA. While our clear PLA bags aren’t used with hot items, we found that our home compostable material would tear too easily as a bag so we had to go with PLA. Why should I use compostable products? What makes them environmentally friendly? From a smear of mayonnaise or a spot of icing soaked into a paper bag, to an entire sandwich left unopened in the pack, packaging tainted with food cannot be recycled. Meanwhile packaging that combines different materials (for example a card salad pack with a plastic window or a paper coffee cup with a liner) can be very difficult to separate. Compostables on the other hand, love food waste – it even helps them to break down more efficiently. Unfortunately the UKs infrastructure for waste leaves a lot to be desired and many industrial composting sites will not accept packaging due to the risk of contamination from non-compostable items. This is immensely frustrating and this frustration is being felt at every stage of the chain from packaging providers and users to the plant operators. All we can say is please believe us when we say we’re working on it. 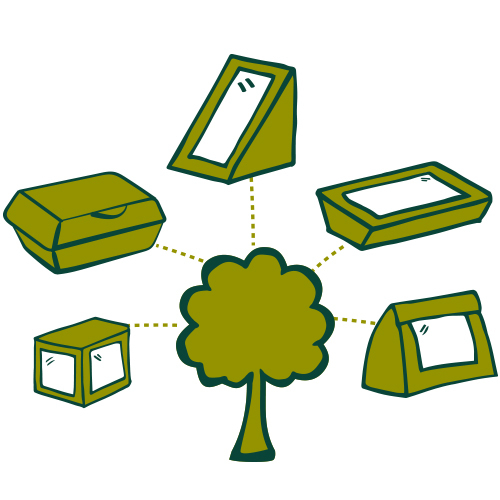 Fortunately three out of four of our packaging products are home compostable which somewhat negates the waste services available (or not) in your local area while also offering your customers a greater autonomy over their own waste. If you would like more information about disposing of Planglow products, please visit our dedicated webpage. And finally, what types of environmentally friendly food container do you offer? We produce packaging for grab and go food offerings - so things like sandwich boxes, bags, containers for salads or deli items, coffee cups (with lids) and bakery packaging. We also offer packaging for hot takeaway foods too. You can browse our online shop for further information.